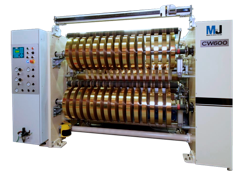 Mason and Jones offer a state of the art commision / trade Slitting and Rewinding Service. Recent investment in a new high performance, CW600 Slitter Rewinder has enabled us to provide a first class slitting service for the conversion of customer supplied materials. The machine is equipped with Razor, Shear, Crush and Hot Slitting to process most materials. The machine has the latest digital drives and automatic tension control to consistently provide high quality finished rolls. For the best Quality and customer service call Tim Mason with your requirements today. Our dedicated customer support team is here to assist with any queries you may have.